Edu-tec takes off through women led initiatives - SABC News - Breaking news, special reports, world, business, sport coverage of all South African current events. Africa's news leader. 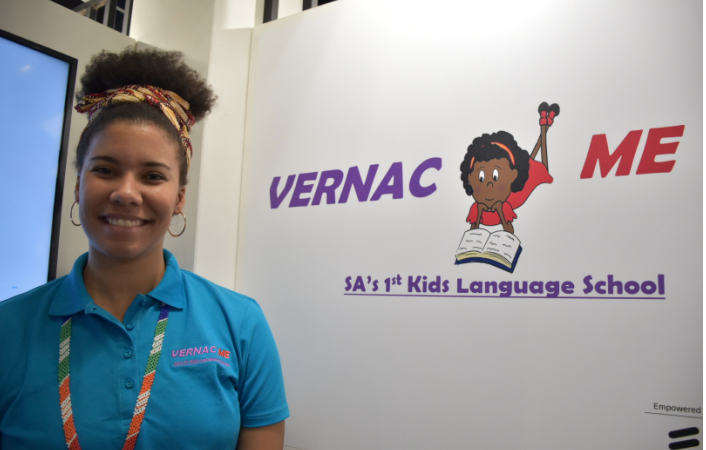 Candice Simone, Digital partner - Vernac Me, a digital based vernacular language learning tool. E-learning is just over 20 years old. Established in 1996, it is one of the growing elements of the internet. With tools like Google Expeditions, online institutions and YouTube tutorials on almost any and everything you can think of, it is not surprising to find a couple of local start-ups trying to make their presence felt in this important aspect of ICTs. Neptech is one such company, started in 2016 by Naledi Mhlongo, they specialise in educational technology. After research, she found that there is a gap in the market for digital learning and teaching tools. With the growth in the sector, there still remains a lack of African language based applications for educational purposes. That’s where Vernac Me comes in, another start-up exhibiting at ITU Telecoms World 2018. They are an ICT based teaching business aimed at the education sector. They focus on learners from the age of 3 – 10 years. Vernac Me came through trying to solve a language based problem in the household of founder, Kholofelo Sadiki, a Pedi speaking woman who is married to a Venda man. could make teaching fun and engaging for the kids. They then realised that there is a gap in the market where education based tools for African languages is concerned. WATCH: Candice Simone, is Digital Partner at Vernac Me, she explains more on the initiative. Both these start-ups are business initiatives by South African young black females. This entry was posted on 12 Sep 2018,02:43PM at 2:43 PM and is filed under Sci-tech. You can follow any responses to this entry through the RSS 2.0 feed. Both comments and pings are currently closed.